Back when DarkLord was attempted to trade portions of his native Darkworld with that of Earth, a series of test transportations were carried out. Devastator was the first live person teleported between realities, used as a test subject for this process. He slaughtered a group of scientists studying the transfers before the Special Operations Strikeforce arrived on the scene and defeated him. 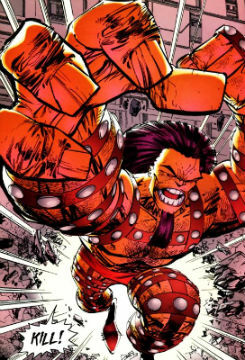 Devastator was later chosen as a temporary host for the Possessor when his own body was undergoing radiation treatment in Stronghold Penitentiary. The Possessor took his borrowed form to Washington, DC where he attacked Dragon. Devastator was defeated, forcing the Possessor back to his own body. The Vicious Circle later recruited the Devastator when SkullFace was putting the criminal organization back together. He accompanied the Blue Broad to abduct Angel Dragon who was to be used as a hostage. Devastator was defeated by Jennifer Dragon who then threw the villain out of sight. Devastator is seen years later as part of a group of VC members going after Malcolm Dragon who had transformed into a monster due to the water he was forced to drink. Devastator is killed when Malcolm hits him in the head with a large boulder.